It’s not just the trails that will keep you coming back, it’s the land, water and people too. Excellent and plentiful trails await you. Over 50 pit stops are waiting along the Iron County trail system to welcome riders in for refreshments, food and good company. Plenty of spots offer pumps for refueling once guests are ready to hit the trails again! Explore more that 200 miles of 4 season trails in Iron County alone. More than any other area in the Midwest! Our scenic area offers just about everything that off-road enthusiasts are looking for. The Iron County trail system offers some of the most beautiful scenic vistas you will ever experience. Five of Wisconsin’s 10 highest waterfalls lie within Iron County and several are accessible or within a short distance by trail. Inland lakes are concentrated in the Mercer area and the biggest lake of them all, Lake Superior, awaits you by trail just north of Hurley. The Penokee Mountains, the Northern Highlands and nearly a million acres of forests offer you terrain unlike anything else in the state. Our thick forests provide a haven for wildlife, as you’ll see frequently when you ride our trails. Hurley is quickly developing a reputation as a great spring, summer and fall getaway. Hurley’s close proximity to Lake Superior is another major attraction to the area. Charter fishing, kayaking and camping opportunities abound. Iron county hosts the Annual Memorial Weekend ATV Rally in the spring. The popular rally attracts thousands of ATVers each year and features a great poker run, an ATV parade and lots of other fun-filled events and activities. 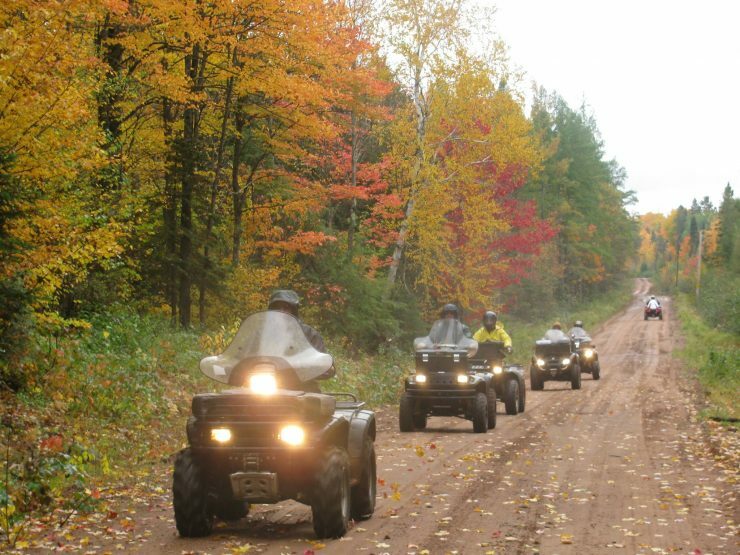 In the fall we also have the Annual Pumpkin Run ATV Rally, featuring many of the same activates, complimented by the area’s beautiful fall colors!